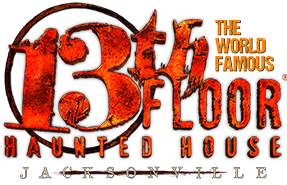 13th Floor Haunted House Jacksonville is a Haunted Attraction located in Jacksonville, FL. Team Giraffic Shark reviewed this Haunted Attraction on October 14, 2018. The 13TH FLOOR haunted house in Jacksonville, Florida installed a haunt in a large retail space as part of a shopping center. According to the information that we gathered onsite, the haunt was loaded in and assembled only weeks prior to opening which is an impressive feat for a haunt of this size! While it is clear that this haunt is new, and will get better with time, the beginnings are extremely impressive as far as scenic design, special effects, makeup and costuming goes. We also experienced some great performances from the cast. We are excited to watch 13TH FLOOR grow and develop over the coming years (and perhaps attend some off-season seasonal haunts as well). 13TH FLOOR had some quality performers including some that utilized dialogue-driven scares and additional strong scares with an effective follow through. However, there were a lot of true “jump scares” where the performers jumped out and immediately retracted back in for the next group. We expect this when the haunts are busy but the attraction was slow as it was towards the end of the night and there was not a group anywhere close to us. Some lingering stalkers or more interaction when possible would have benefitted the scares. There was also a significant amount of dead spaces, including inside a long maze through sewer-like tunnels, with no apparent place for performers to even be hiding. Since it was the end of the night, on one hand, we had hoped that performers had been sent home resulting in the lack of bodies. On the other hand, however, we would hate to see a haunt send home performers, not allowing their Guests towards the end of the night to have the same experience. Highlighted performers were the man that welcomed our group into the first room, the bookshelf slider, and the voodoo queen in the final scene. Although once again, upon passing the voodoo queen to the very last scare, a strobe light and sound effect were triggered, exposing the location of a missing performer. The costuming at 13TH FLOOR consisted of notably high-quality pieces, revealing the extreme level of detail on each and every themed costume. The makeup and masks were similar in quality, consisting of a wide range of types and styles which made for quite the visual buffet of characters to look at! The amount of time and money that went into sourcing, designing, laying out the locations, and creating all of the looks of these costumes is really spectacular. A lot of these characters could easily walk right into a movie set without an eye being blinked. The employees at 13TH FLOOR were overall hospitable and friendly, though it was clear that some were ready to go home and counting down the minutes until they could lock the doors (including the woman who delivered the safety speech unintelligibly at a quick, uninterested pace while sitting down at the entrance to the haunt). The lady who took our photo and checked our tickets was extremely friendly and helpful, and glad to have Guests to interact with. The entire walkthrough was extremely safe and easy to traverse and despite several floor-based special effects, it managed to have very even footing with no trip hazards. The attraction has a very detailed website and other Social Media pages, providing detailed information making it easy to find answers to any questions prior to visiting, and GPS directions took us right to the location without any troubles. The location was easy to spot with an illuminated sign on the storefront and visible ticket booth and other amenities. The 13TH FLOOR is in a storefront of a shopping center, with little theming outside, except for a beautiful, custom sign designating the location of the haunt. According to Social Media postings, and advertised in the FAQ on the website, it appears that there are normally atmosphere performers appearing outside, setting the mood and working the queue. Again, since we arrived later in the evening, it seems as though these performers had already left for the night, so we did not have that experience and no performers were seen until the team entered the actual haunt. There is a photo opportunity before entering the haunt, and it seems as though some characters will often join in on the photos to make for a more exciting picture (and the attraction probably sells more with characters in them than just Guests in front of an authentically distressed wall). Upon entering the building after the photo, the dimly lit façade is gorgeous, though we wish it were possible to theme the outside of the building as such, however, we realize the constraints of operating in a shopping center. It is clear that the scenic design team behind the haunts of the 13TH FLOOR is extremely talented and knows their craft exceptionally well. Scenes are well designed and rather detailed, though they could use some additional props and details as the haunt ages to create more distractions and items to look at. Large, scenic special effects are well incorporated into the themes and settings without ever feeling like they were added just to use the effect somewhere. 13TH FLOOR has benefitted from having a large team who travels the country to see many different haunted attractions to combine the best ideas to use in their haunts. However, it appears they aren’t afraid to copy scenes a little too closely for my design taste (including a few scenes directly pulled from Universal Orlando’s Halloween Horror Nights 2017 house, Dead Waters – though not as detailed and textured as the HHN version). “Outdoor” scenes, though well done, will benefit from some more time spent detailing and dressing out the locations (a comical small Christmas tree used as a branch was noticed on a large tree prop). Similarly, some rough edges were noticed (and only stuck out because the rest of the haunt was SO polished), including some exposed plywood (in a performer-less chainsaw cage), as well as the exit door to the haunt, leaving Guests with an unfinished image as their final impression. 13TH FLOOR utilizes state of the art special effects, proving that no effect is too large or involved to be incorporated into their attraction. Further time could be spent in programming these effects, making sure timing is triggered appropriately, and adjusting audio levels to an appropriate volume. Many of the audio triggers were far too loud, causing pain, and while scary due to the sheer volume, they did not match the intensity or character providing the jump scare (i.e. an animalistic roar when a human woman jumps out of a filing cabinet, for example). 13TH FLOOR has an unbelievable start on their effects, especially considering their quick build, but some additional finesse, programming time, and detail work will elevate the haunt to a level that will be extremely hard to compete with, as the quality of the individual technical pieces is already soaring high. 13TH FLOOR advertises three distinct themes for its attraction, LEGEND OF THE SAW, DEAD END DISTRICT, and CURSED VOODOO. Each theme can be precisely identified within the attraction, however, there aren’t exactly clear borders between each theme, and it seems that the themes mix and overlap at times, along with some more generic themes interspersed. Rather than going in looking for these themes, Guests are better off entering not expecting any specific themes and figuring out the themes for themselves rather than looking for distinct storylines and themes. 13TH FLOOR packs some impressive scares, including some well-hidden performer scares all the way to scares provided by the special effects. 13TH FLOOR has everything you’d see on the floor at Transworld, and then some. As mentioned above, some scares need to be tweaked to allow the performers to drive the scare rather than the sounds. The performers are talented and trained to scare, so the sound effects can be used to assist the scare rather than drive it. Trigger scares were timed well overall, though some of them went off a bit late, especially due to our small group size. When more performers are added to the attraction, we expect that the intensity would be greater and more scares are present but even as it stood, the scares were still very strong, so we can only imagine how pulse-pounding this attraction would be when fully staffed. Tickets prices to 13TH FLOOR range based on peak nights, as well as the time of purchase, with tickets cheaper in advance, and more expensive on the day of purchase as well as onsite purchases. For example, tickets in advance of the night we visited would have been $29.99, but since we didn’t purchase until our arrival, the tickets were nearly ten dollars more. So Guests are advised to pay close attention to this and plan ahead if possible. The lowest ticket price we noticed that was available was $19.99. It took our group about 20 minutes to tour the attraction so, at the lowest ticket price, that’s right at a minute of entertainment received per dollar spent. While we found the price of admission worth it for the special effects and design elements alone, we were disappointed to not have more performers in the attraction, and the attraction already shutting down for the evening 45 minutes prior to closing. In addition to purchasing tickets ahead of time, Guests are advised to visit toward the beginning of the evening, though crowds may be greater, the attraction will hopefully be in full swing at that time. Needless to say, you need to buy a ticket and head out to see what lies on the 13TH FLOOR, as it will truly amaze and shock you.